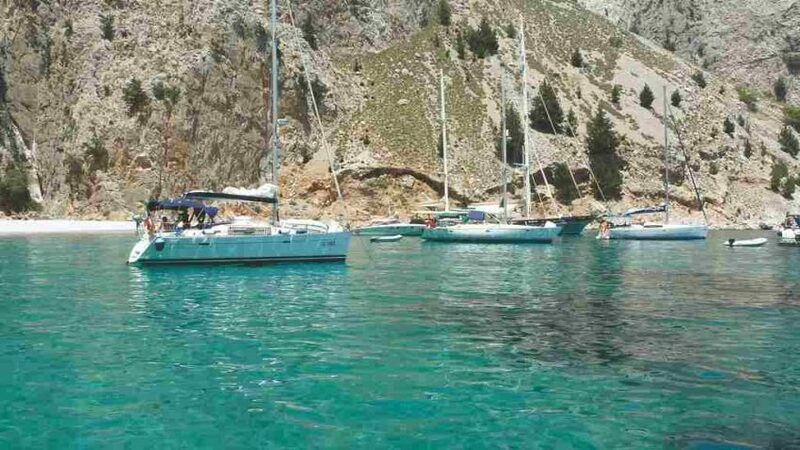 If you are looking to take an RYA training course in the Mediterranean, learning to sail in Greece, in the warm and sheltered waters of the Ionian represents the perfect location. 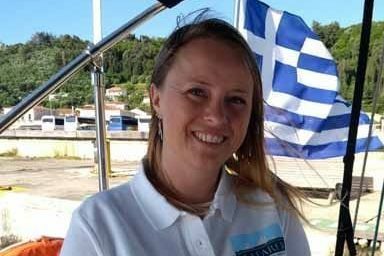 Our sailing school, Seafarer Training, is based on the island of Lefkas, ideally situated to head either south to the islands of Kefalonia, Ithaca and beyond or north towards Paxos and Corfu. If you are taking either the Competent Crew or Day Skipper course, our tuition yachts generally head south, with protected waters and plenty of harbours and bays for mooring and pilotage. Additionally we link up with our flotilla on most evenings, so you will be sailing in a beautiful area and meeting like minded sailors. 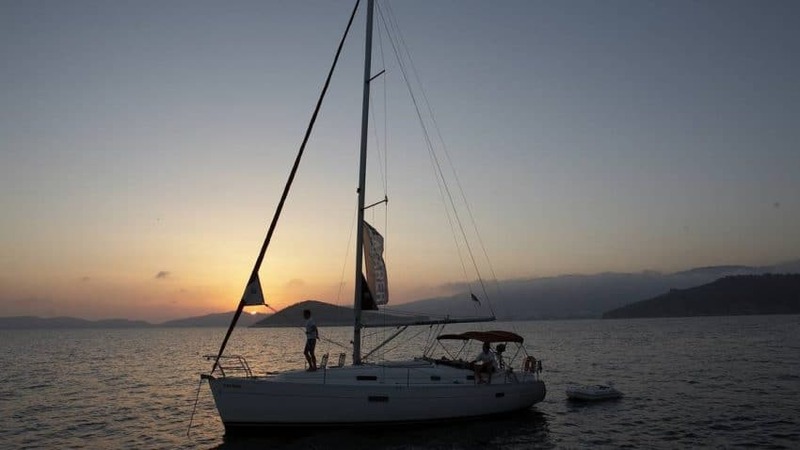 For Coastal Skipper or Yachtmaster Preparation, then the waters to the north of Lefkas offer open seas, longer passages and busier waters around Corfu. If you value your privacy, we also offer private tuition on RYA courses. 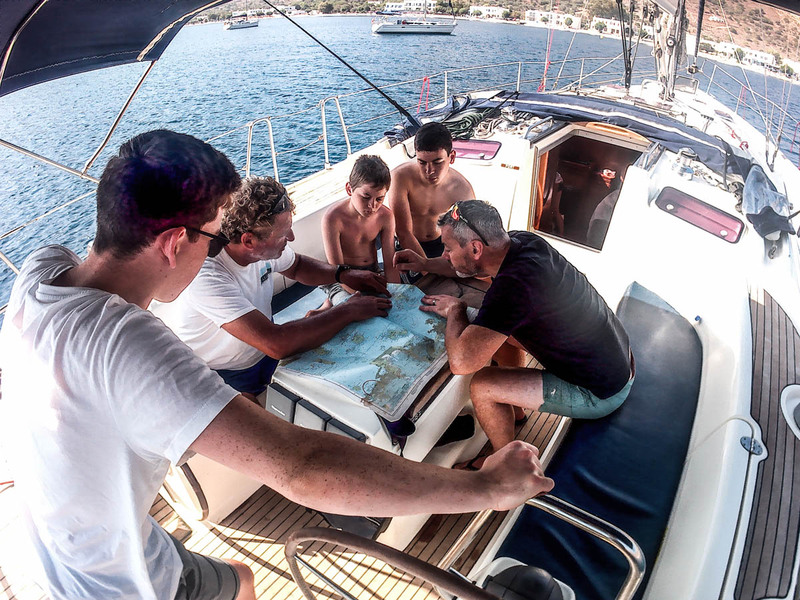 You’ll stay on board a dedicated training yacht not shared with other students, with an RYA instructor at your side to guide and instruct, as you cruise around the Ionian Sea. 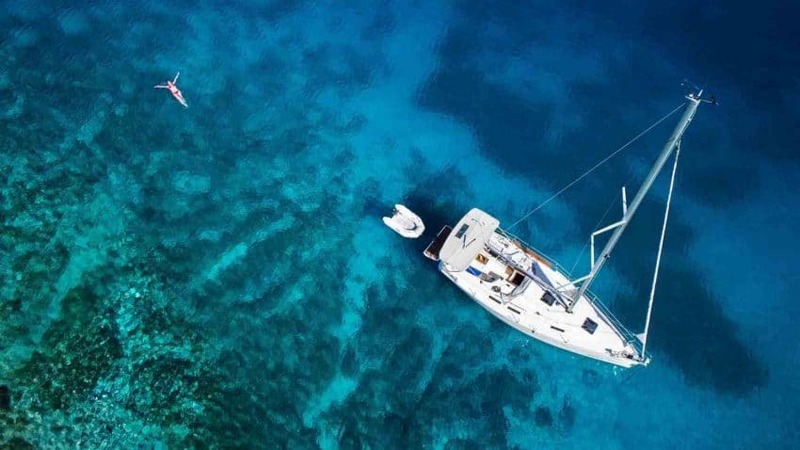 Depending on your previous experience, you’ll fly home with a Start Yachting, Competent Crew or Day Skipper feather firmly in your nautical cap. 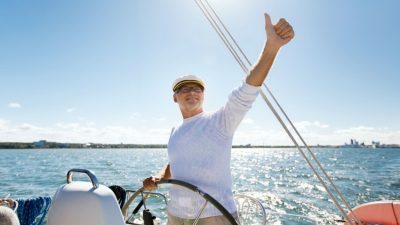 If you are looking to charter a yacht, either as part of a flotilla or on a bareboat basis, then the RYA Day Skipper practical course is the right choice. 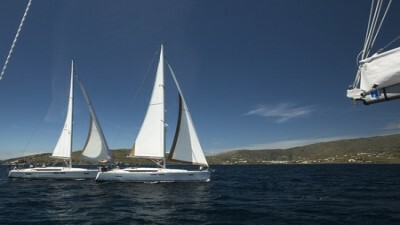 This will give you all the practical skills to charter in the coastal areas of the Mediterranean. 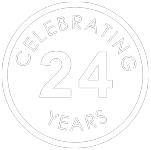 The RYA Day Skipper certificate also entitles you to the ICC (International Certificate of Competence) which is issues by the RYA on production of your Day Skipper certificate. Seafarer Training is fully recognised by the Royal Yachting Association. Tuition yachts are regularly inspected and comply with RYA / MCA guidelines and Codes of Practice for Sail Training Yachts. All instructors for both RYA and Non RYA courses advertised are RYA qualified commercially endorsed Yachtmasters and cruising instructors as a minimum. 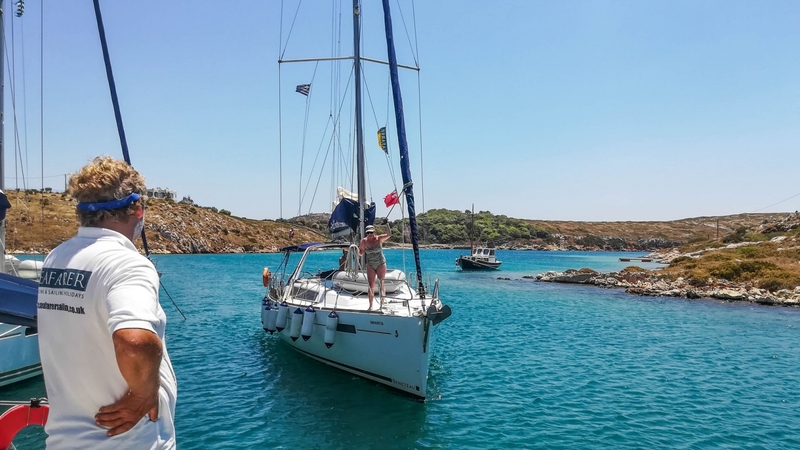 You can be reassured that safety procedures and equipment are regularly monitored and inspected to comply with both the British RYA and Greek maritime authority regulations. 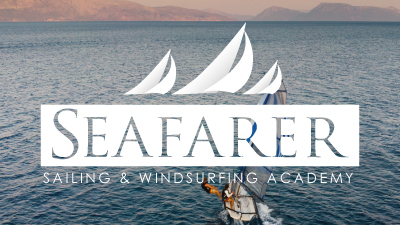 At Seafarer we ensure that all our recommended courses are both safe and enjoyable offering a high standard of tuition and comfort. You are under the supervision of an RYA qualified instructor whilst at sea. All our RYA instructors hold the requisite first aid certificates and are fluent in English (all courses delivered in English, as per RYA regulations). Safety equipment on our tuition yachts complies with both local and British regulations. 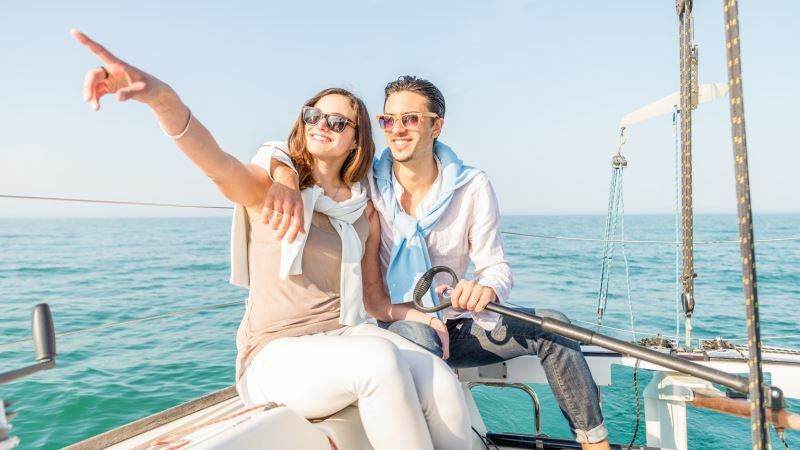 All yachts have DSC VHF radios, handheld VHF radios and mobile phones. Slim-line inflatable life jackets, harnesses and crotch straps are provided for each person aboard, with extra spares carried. 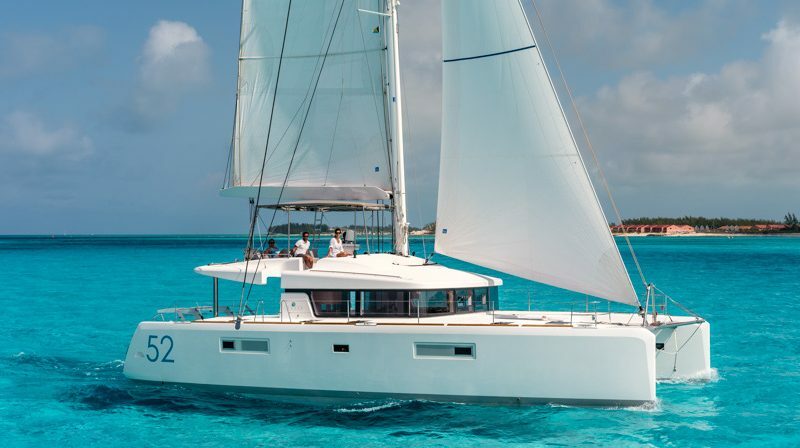 For your comfort, all yachts are equipped with Bimini sun tops (sun shade), hot water, 2 sh/wc’s, deck shower, electric fridge, fully equipped galley and radio / CD player. Accommodation on board is in double / twin or single cabins or you can book a saloon berth. Sheets, pillow cases, pillows, blankets / duvets and towels are all provided. Instructor / student ratio is maintained at a maximum of 5 students per instructor, in line with RYA codes of practice. 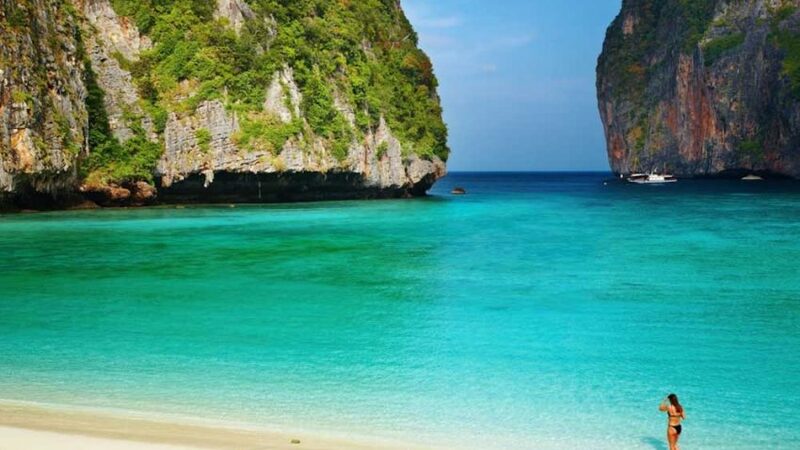 A choice of Sunday charter and low cost flights are available from London Gatwick and Heathrow to Preveza airport with same day return. 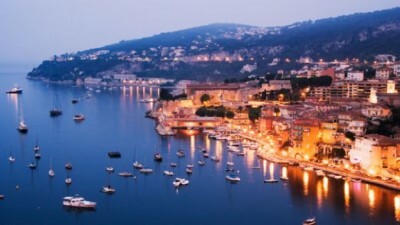 Regional charter flights from Manchester, Birmingham, Bristol and Stansted are also available. Flight time is approximately 3 hours. 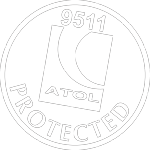 Book your flights with us for full ATOL protection of your package. The transfer time from Preveza airport to our base takes approximately 45 minutes. We would be happy to arrange this for you if required. 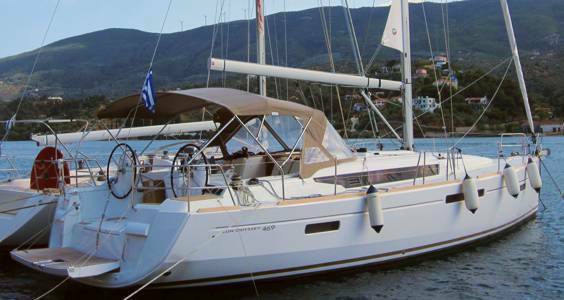 Our fully coded RYA Training Yachts in the Ionian are Bavaria 44 “Agios Nikolaos” and Bavaria 39 “Orestis” . With two double guest cabins (plus an extra twin cabin on the 44) and 2 shower/WC’s, the yachts are never overcrowded. With an ample cockpit, wheel steering and spacious saloon, there is room for everyone to spread out and relax. 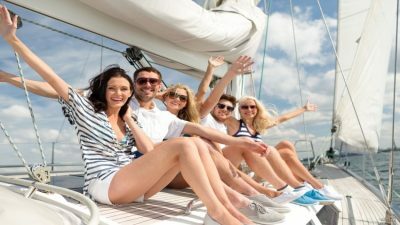 The yachts are fully equipped with TV & DVD player, music system with cockpit speakers, deck shower, hot water and all the safety equipment required to make your course safe, secure and relaxing. For those looking for private tuition, we have a selection of suitably equipped yachts available, including newer model yachts from 33 to 45 foot, plus larger yachts for “big boat” experience. 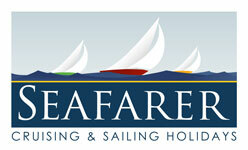 The Seafarer Training sea school is located on the east coast of Lefkas island. 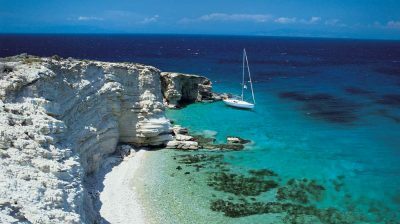 The island is connected to the mainland by a causeway providing a quick and easy transfer from the airport in Preveza. Alternatively you may wish to fly to Athens which offers greater flexibility of carriers and arrival times. From Athens you can book a 45 minute domestic flight to Preveza or travel by coach, costing approximately 35 euros, directly to Lefkas in around 4.5 hours. Sailing is a social sport and an RYA sailing course can be an ideal holiday and way to make new friends. Our RYA instructors have all been chosen for their sociable approach as well as their expertise to make the time you spend with us as much fun as it is a learning experience. 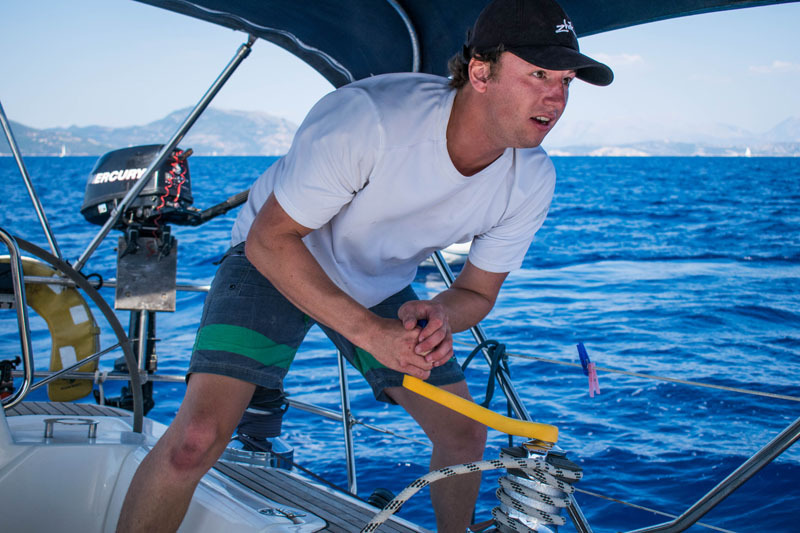 Our 6 day tuition courses operate alongside both our ionian flotillas and give students the opportunity to enjoy mixed company evening meals with like-minded sailors. 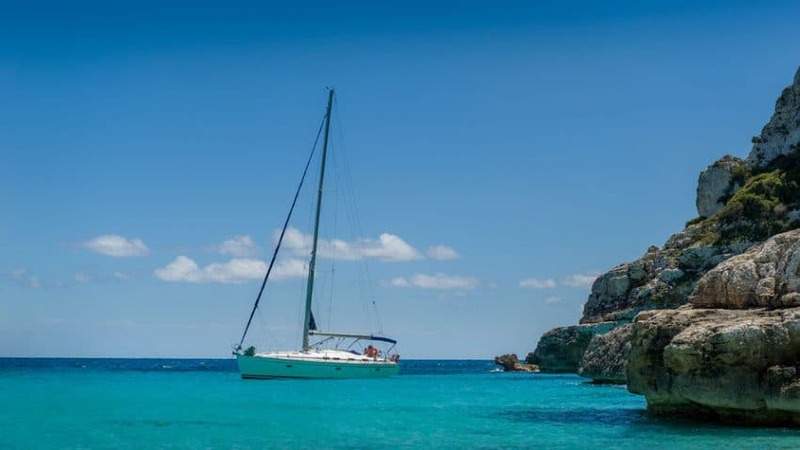 The Ionian is ideal for learn to sail for both novice and advanced students alike, offering not only sheltered waters but, a good selection of lights, buoys and situations that will enhance your learning experience as you progress through the RYA sail training programme. The winds tend to be light in the mornings and give plenty of opportunity to practice boat handling skills. By mid-afternoon the wind builds providing excellent sailing. There are plenty of locations where we can find stronger gusts to safely demonstrate more demanding sailing skills..
Our sea school ethos has always been to put safety first and we aim to empower each of our students by offering simple and patient instruction, in order that they may gain confidence in their own ability as they learn how to sail and take their first steps as skipper or undertake longer offshore coastal passages. 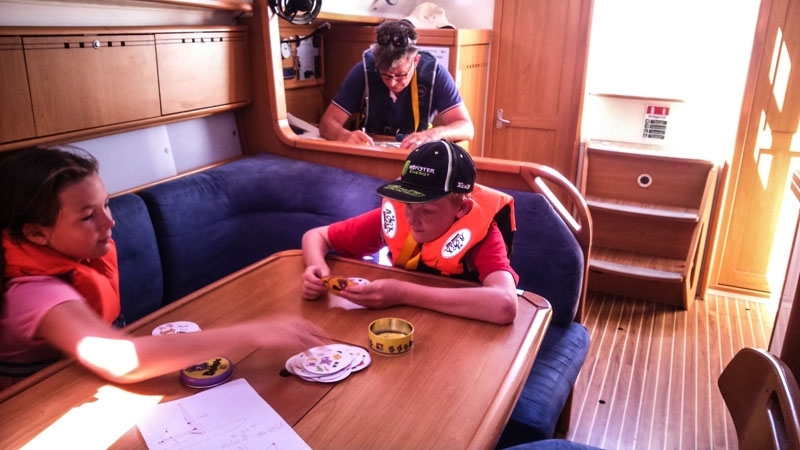 Whilst The RYA training programme can be joined at any level from Competent Crew to Yachtmaster, we welcome family groups and our 6 day courses (7 nights on board) have a good balance of tuition and plenty of fun time. Children have a chance to meet other kids and enjoy the social aspects of our flotilla groups, where we organise a variety of events including a welcome party, beach party and other activities or trips ashore to keep everyone entertained. We often combine our RYA Competent Crew and Day Skipper courses on the same tuition yacht, so that students might learn from each other. The maximum student/instructor ratio is 5:1. Our coastal skipper courses are ideal for those who already have the recommended minimum pre-course experience. On arrival at our base you will be greeted by our instructors and shown to your yach. After a basic introduction and safety brief, you are free to relax for the night or mix with other clients. Our courses start on the Monday morning and run for 6 days until mid afternoon the following Saturday. 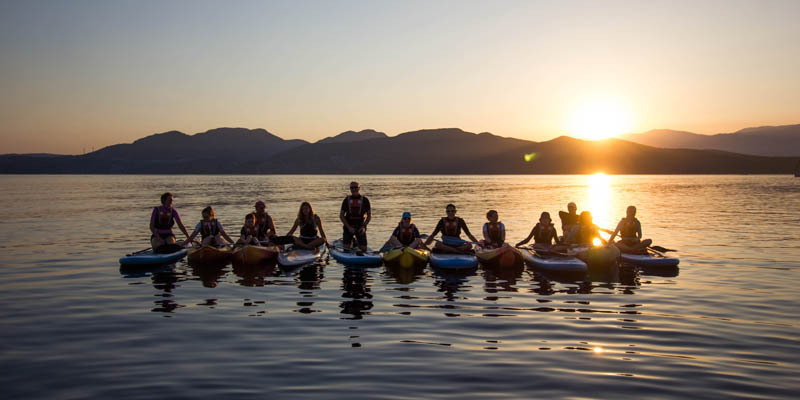 We organise a farewell dinner joining our flotilla group in Lefkas on the Saturday night which is always good fun. Transfers and flights usually take place on Sunday morning and clients are welcome to stay on board until then. Students are accommodated in shared twin and double cabins with options for sole occupancy also available. We supply fresh bedding, pillows and towels. All Marina fees and fuel costs are included. Tea & coffee, bottled drinking water, provisioning for continental breakfast, light lunches and snacks are supplied whilst aboard. We recommend that students eat ashore in the evening in one of the many excellent tavernas, often meeting with our flotilla groups in the Ionian islands. If you want to find out whether you might love sailing then this is the course for you! You do not need any previous sailing experience and is an excellent introduction to the RYA training scheme. The course is great for those who are looking to learn a little whilst enjoying their holiday, or for younger children in your party who want to get involved in the sailing. The course provides an opportunity to be involved in handling the boat under sail and power and can be completed at a leisurely pace whilst others are completing their competent crew or day skipper courses. Experience and skills gained on the course can then count towards your RYA Competent Crew course if you decide that sailing is for you! Once you have completed the course your Instructor will sign your logbook to enable you to keep a record of your sea miles and syllabus completed. On successful completion of your RYA Start Yachting Course you will also receive a Start Yachting RYA certificate. Ropework – Ability to tie four different knots, as well as securing a rope to a cleat and use of winches and jamming cleats. Underway – Experience sailing a yacht on all points of sail and steer a yacht under sail and power. Rules of the road – Keeping an efficient look out at sea. Meteorology – Know where and when to obtain a weather forecast. Man overboard recovery – Understand the action to be taken to recover a man overboard. Clothing and equipment – Understand and comply with the rules for the wearing of safety harnesses, lifejackets and personal buoyancy aids. Emergency equipment and precautions – Awareness of hazards on board a yacht and know the actions to be taken in the event of an emergency. The completion certificate is included in the cost of your course. This course is ideal for beginners to learn the basics and for those who would like to become active crew members rather than just passengers. By the end of this 6 day course you will not only be competent but a confident member of the yacht crew and be able to steer, handle sails, keep a lookout, row a dinghy and assist in all the day to day routines associated with the vessel. During our Competent Crew course you will spend 6 days aboard the yacht visiting many of the harbours and anchorages of the Ionian and have the opportunity to complete a longer passage and to experience some night sailing. We often meet up with our flotilla groups and share evening meals. Safety is paramount in all RYA courses and you will learn how to operate flares, life jackets, safety harnesses, life-rafts and how to assist the recovery of a man overboard. At the end you will be awarded the RYA Competent Crew Certificate and be an asset to any crew you join. Knowledge of sea terms and parts of a boat, her rigging and sails – sufficient knowledge to understand orders given concerning the sailing and day-to-day running of the boat. Ropework – Handling ropes, including coiling, stowing, securing to cleats and single and double bollards. Ability to tie the following eight knots and to know their correct use: figure-of-eight, clove hitch, bowline, round turn and two half hitches, single and double sheet bend, reef knot. Personal safety equipment – Understands and complies with rules for the wearing of safety harnesses, life jackets and personal buoyancy aids. Man overboard – Understands the actions to be taken to recover a man overboard. Manners and customs – Understands accepted practice with regard to: use of burgees and ensigns, prevention of unnecessary noise or disturbance in harbour including courtesies to other craft berthed. 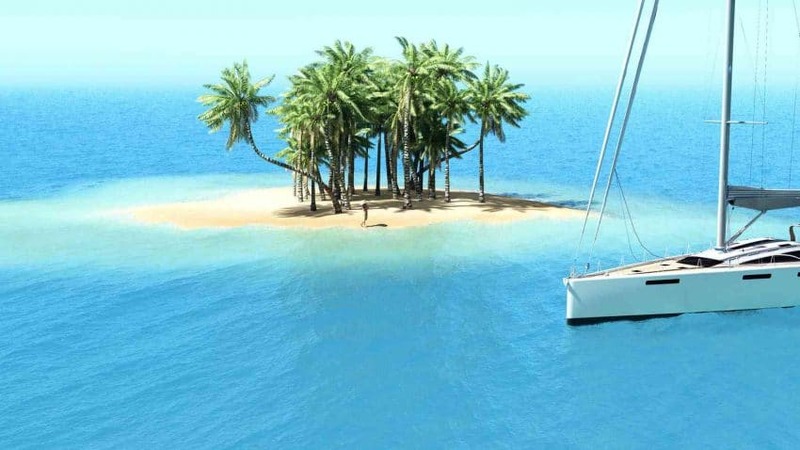 Aware of the responsibilities of yacht skippers to protect the environment. General duties – Has carried out general duties satisfactorily on decks and below decks in connection with the daily routine of the vessel. Skippering a yacht for the first time can be an intimidating yet exhilarating experience. The RYA Day Skipper Practical Course is designed to teach you how to take charge of a yacht safely and confidently. A skipper does much more than navigate. 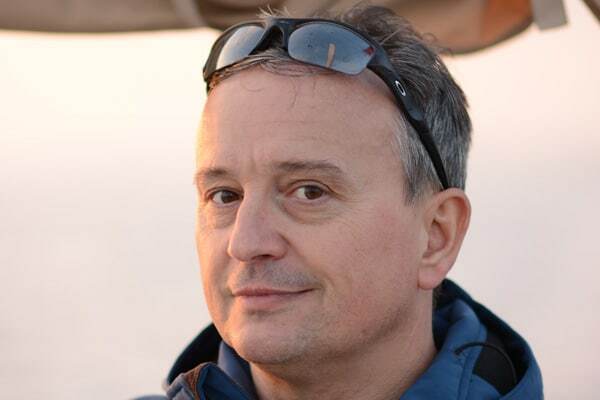 They are also responsible for the complete safety and well being of the yacht and crew. These responsibilities include weather forecasting, victualling, engine maintenance, sail selection and handling, passage planning, watch keeping, navigation and pilotage. This course gives you the chance to take charge and skipper the boat on short passages, under instruction, with plenty of advice and support from our instructors. Time is spent demonstrating and practicing basic seamanship with emphasis on boat handling skills. We explore the practical solutions to navigation and build confidence during pilotage exercises. Students live aboard for the duration of the course in single occupancy or shared cabins and visit many different harbours and anchorages to practice pilotage techniques. We have a flotilla operating in the area and often join them in the evenings and excellent way to make new friends and share sailing experiences. You will complete at least 4 night hours sailing to experience night pilotage and identify lights. Students who have successfully completed the Day Skipper course are awarded the RYA Day Skipper Completion certificate. 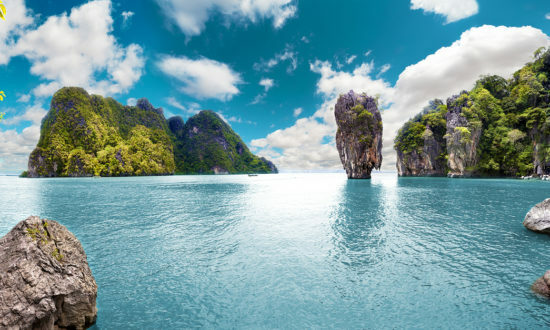 In addition they can apply to the RYA for the International Certificate of Competence (ICC), which is an internationally recognised qualification and ideal for future Flotilla holidays or progression to ‘bareboat’ yacht charter. 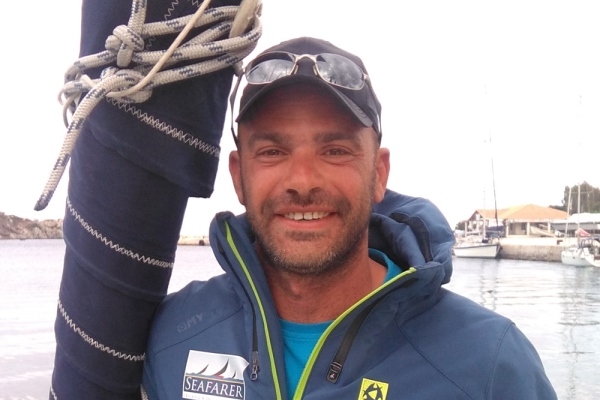 Pre-course Requirements: 5 days at sea, 100 miles, 4 night hours. Navigation to Day Skipper Shorebased standard and basic sailing ability. 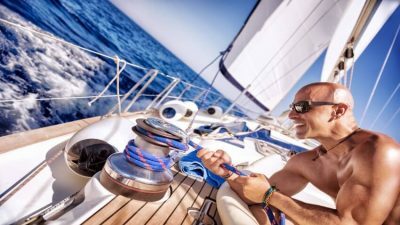 Preparation for sea – Is able to prepare a yacht for sea, including engine checks, selection of sails, securing and stowage of gear on deck and below. Deck work – Can reef, shake out reefs and change sails to suit prevailing conditions. Can prepare an anchor, mooring warps and take charge on deck when mooring alongside, coming to a buoy, anchoring, weighing anchor and slipping from a buoy or an alongside berth. 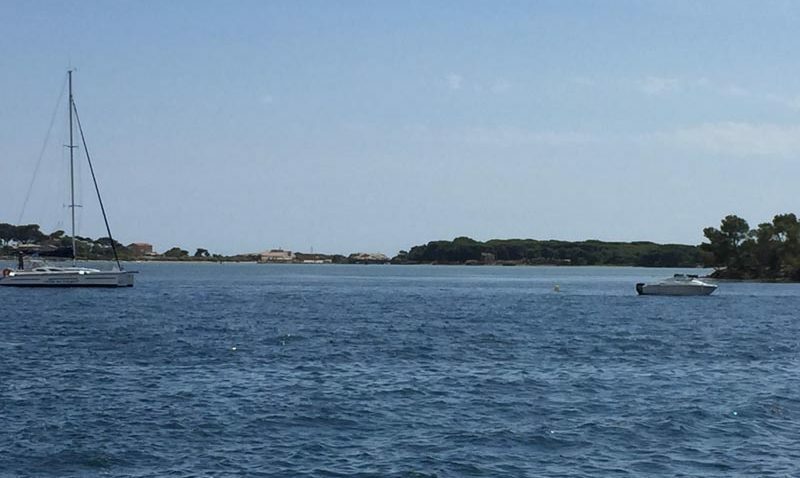 Pilotage – Can prepare and execute pilotage plan for entry into, or departure from, harbour – Understands the use of leading and clearing lines – Use of transits and soundings as aids to pilotage. Rules of the road – Has a working knowledge of the International Regulations for Preventing Collisions at Sea. Maintenance and repair work – Understands and is able to carry out routine maintenance tasks – Knows the properties and uses of common synthetic fibre ropes. Engines – Knows how to change fuel and water filters, pump impeller and to bleed the fuel system. Victualling – Understands how to victual a yacht. Emergency situations – Is able to take correct action as skipper for recovery of man overboard – Understands distress flares and how to use a life raft – Can operate a radiotelephone in an emergency and send a distress message – Understands how to secure a tow – Understands rescue procedures including helicopter rescue. 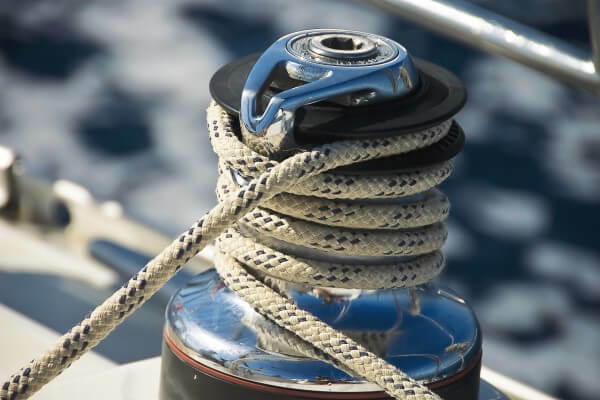 Yacht handling under power – Can bring a boat safely to and from an alongside berth, mooring buoy and anchor under various conditions of wind and tide. 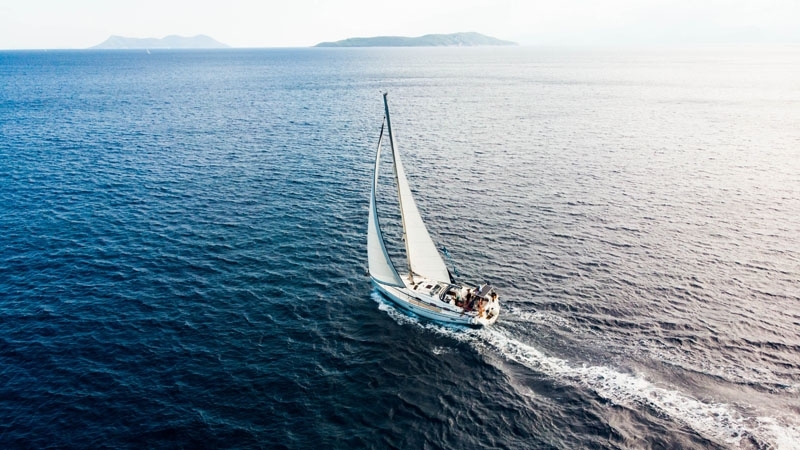 Yacht handling under sail – Can bring a boat safely to and from a mooring buoy and anchor under various conditions of wind and tide – Can steer and trim sails effectively on all points of sailing. Passage making – Can plan and make a coastal passage, taking account of relevant navigational hazards and limitations imposed by the type of boat and the strength of the crew. Please note that from 1st January 2017 the above syllabus will be combined with the existing tidal syllabus to offer a combined tidal syllabi in accordance with changes to the RYA sail cruising scheme. For those students who take a course with us from 1st January 2017 onwards, your certificate will no longer be marked with a tidal / non-tidal option. Skippering a yacht on coastal and offshore passages demands strong navigation, seamanship and leadership skills. The RYA Coastal Skipper Practical course prepares those with previous skippering experience to undertake longer voyages. During the RYA Coastal Skipper course your instructor will guide you through navigation, both offshore and in limited visibility, weather forecasting and passage planning, watch keeping and preparation for sea. You will put this all into practice as each student plans and executes passages taking complete command of the yacht. 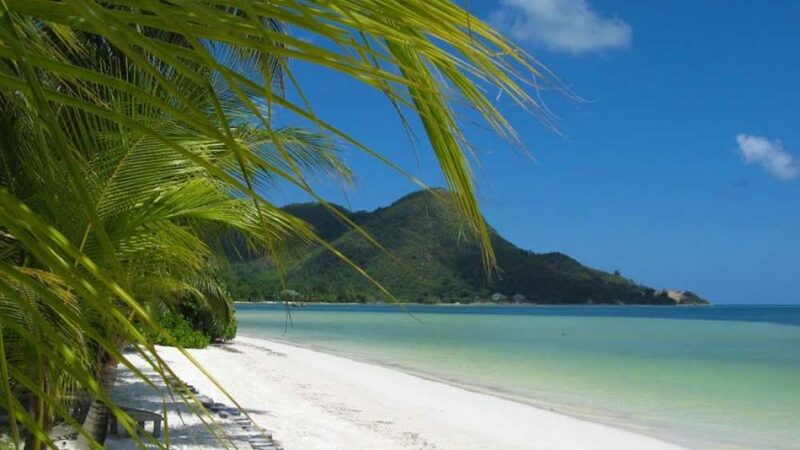 Coastal skippers must be good boat handlers and you will receive plenty of practice mooring the yacht and longer coastal passages with plenty of night sailing. At the successful completion of the RYA Coastal Skipper course you will be awarded the RYA Coastal Skipper Course Completion Certificate and will be able to skipper on coastal passages safely and confidently by day or night. 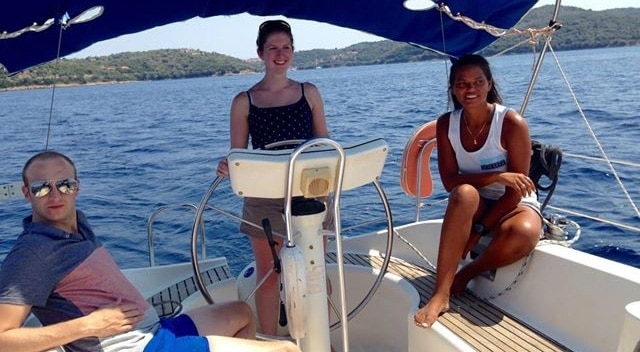 Our coastal skipper course gives the chance to complete longer passages from our base to destinations such as Corfu and Zante. Pre-course Requirements: 15 days, 2 days as skipper, 300 miles, 8 night hours. Navigation to Coastal Skipper shorebased standard. Sailing to Day Skipper standard. 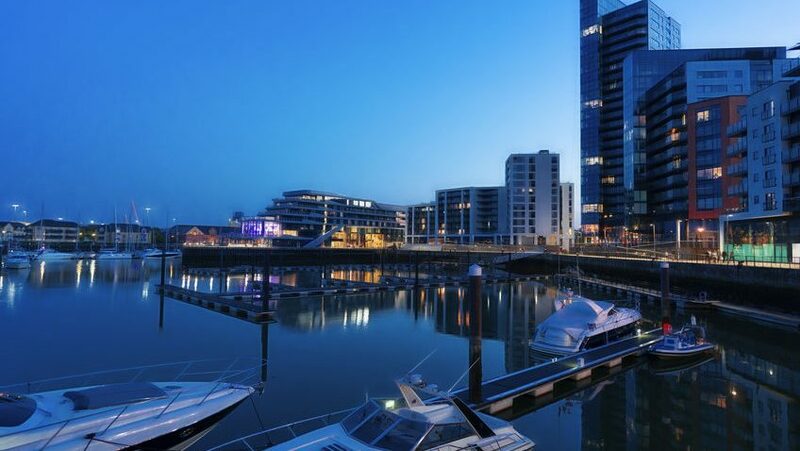 Passage planning – Can plan a coastal passage including a consideration of the capability of the yacht, navigation, victualling, weather, ports of refuge, tidal heights and tidal streams, publications required and strategy – Knows Customs procedures. Yacht handling under power – Can control the yacht effectively in a confined space under power – All berthing and unberthing situations in various conditions of wind and tide. 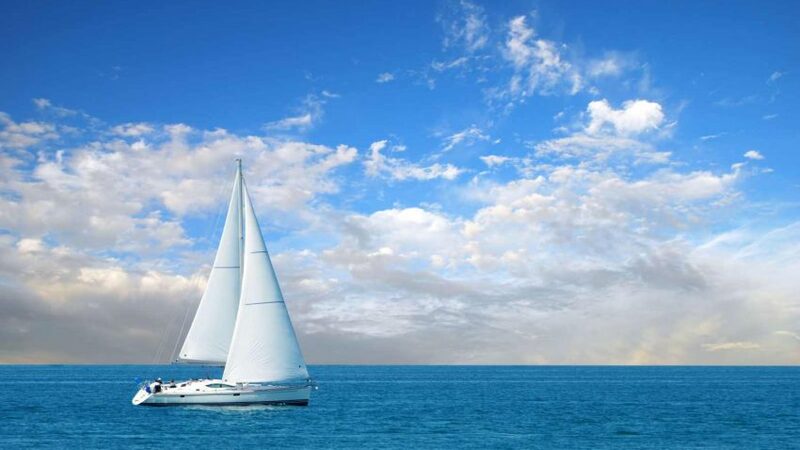 Yacht handling under sail – Can use the sails to control the yacht in a confined space – Anchoring and mooring in various conditions of wind and tide – Can sail efficiently on all points of sail. Adverse weather conditions – Preparation for heavy weather and yacht handling in strong winds – Navigation and general conduct in restricted visibility. Emergency situations – Recovery of man overboard under power and sail – Understands action to be taken when abandoning to the life raft and during helicopter and lifeboat rescue. We have two different pre-flotilla courses on offer, depending on your level of experience. These courses are designed for those with previous experience (yacht owners, experienced dinghy sailors, etc.) who either have a recognised skippers certificate but are out of practice or alternatively have the knowledge and confidence to formalise these courses with an ICC assessment at the end of the course. Please note that these courses do not in themselves grant you the appropriate documentation to skipper a yacht in Greece. 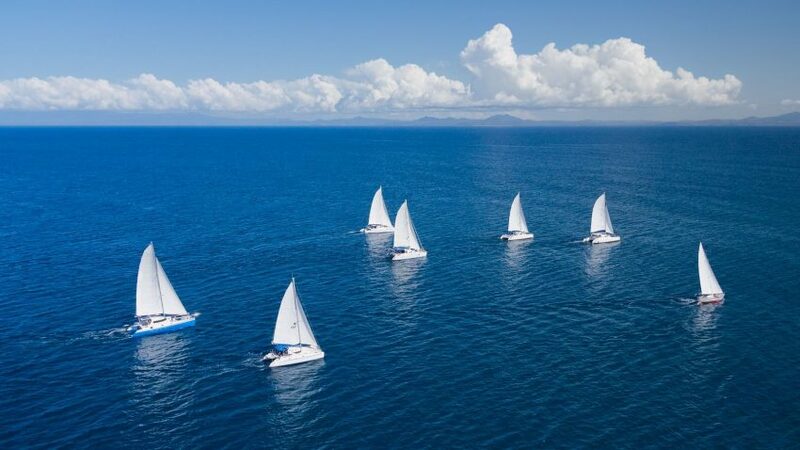 Our two day course is designed as a refresher course for those who would be able to partake in a flotilla holiday with confidence upon successful completion of the course. The course is usually run on board a flotilla yacht that has been chartered by you for your flotilla holiday. 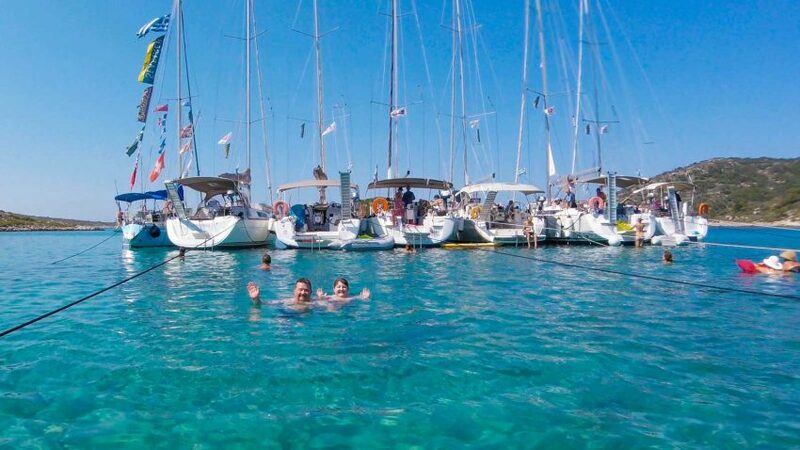 You would then spend the first three days on the water with an instructor covering the areas of skippering and boat handling required to ensure that you can complete your flotilla holiday in confidence. The Yacht – Familiarisation with your charter yacht, including engine and sail controls. Power handling – Basic boat handling under power, including anchoring, use of shore lines and “Mediterranean” style stern-to mooring. Sail Handling – Basic sail trimming, reefing and sail controls. Navigation – Simple position fixing, line of sight navigation and GPS familiarisation. Safety – Basic safety procedures when moored and under way. Communications – Operation of your VHF radio. Radio etiquette and local customs. Client Specific – Any other area of knowledge where you need training (subject to time and operating limitations). 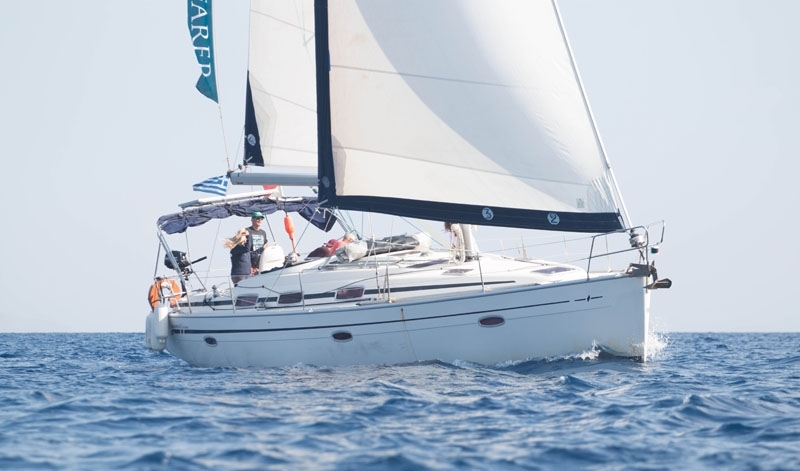 Our five day pre flotilla course is designed specifically to take you from having little or no skippering experience to the level required to safely and competently enjoy a flotilla holiday on board your own chartered yacht. Where possible the course will follow the flotilla route, with the advantage that you and your party will be able to enjoy and participate in the social aspects of the flotilla, including punch parties and group meals on several evenings during a flotilla week. The Yacht – Parts of a boat, her rigging and sails. Ropework – Understanding of the rigging. Practical knowledge of commonly used knots. Sail handling – Basic sail trimming and sailing on all points of sail. Understanding of reefing controls and when to reef. Navigation – Simple position fixing, line of sight navigation and GPS familiarisation. Chart reading and chart symbol identification. Safety – Basic safety procedures when moored and under way. Including First Aid, use of flares, fire precautions and man overboard recovery. We can offer this certification as part of our practical courses from Day Skipper onwards, or it can be achieved as a stand alone training and assessment on your own vessel. If you require an ICC valid for use on inland waters, you must learn the CEVNI code and sit the CEVNI test. If you take a stand alone assessment, you can do this during your flotilla holiday onboard your flotilla yacht or our training yacht. If you wish to take the course as part of another course (for example a pre-flotilla course) or training program then we can organise this for you. Regulations – 1. Knows responsibility for keeping a proper lookout 2. Can determine a ‘safe speed’ 3. Can recognise a potential collision situation 4. Can identify ‘give way’ vessel in a collision situation 5. Knows what action to take as ‘give way’ and ‘stand on’ vessel 6. Knows responsibilities of a small vessel in a narrow channel 7. Can recognise manoeuvring signals (1,2,3 & 5 short blasts) 8. Can make and recognise visual distress signals. Safety – . Is able to use and instruct crew on the use of: Lifejackets Distress flares Fire extinguishers ‘Kill cord’ (if fitted) 2. Can prepare a boat for use and take sensible precautions before setting out, including: Engine checks – Check fuel for range/duration of trip – Obtain weather forecast – Avoid overloading boat. Regulations – Understands CEVNI (European Inland Waterways Regulations). Regulations – 1. Knows rules relating to Traffic Separation Schemes 2. Knows requirements for navigation lights and shapes to be displayed by own vessel 3. Can recognise the following from the lights: Power driven, sailing vessel, vessel at anchor, tug and tow, fishing vessel, dredger 4. Knows sound signal to be made by vessels as in Q3. Pilotage – 1. Can recognise, by day and night, and understand significance of buoys of the IALA system _ 2. Knows sources of information on: local regulations, port entry and departure signals, VTS and Port Operations Radio 3. Can plan a harbour entry/departure, taking account of possible presence of large vessels and avoiding navigational hazards. 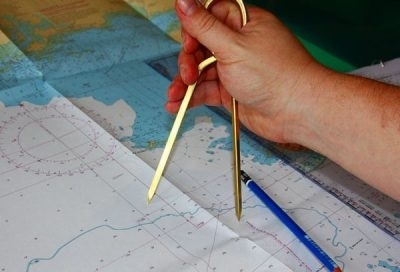 Navigation – (Chart & Plotting Instruments required) 1. Can interpret a navigational chart, understand significance of charted depths and drying heights and can identify charted hazards 2. Can plot position by cross bearings and by Lat/Long 3. Can determine magnetic course to steer, making allowances for leeway and tidal stream 4. Can use a tide table to find times and heights of high and low water at a standard port 5. Can determine direction and rate of tidal stream from a tidal stream atlas or tidal diamonds on a chart 6. Understands basic use of GPS. Start – Give safety briefing including use of safety equipment – Has listened to weather forecasts – Pre start engine checks – Start engine – Check cooling – Knows fuel range. Depart from Pontoon – Understands use of springs to depart from lee wall/pontoon – Communicate with crew – Position fenders correctly. Securing to a Buoy – Communicate effectively with crew – Prepare warp – Choose correct angle of approach – Control speed of approach – Secure boat effectively – Depart from the mooring safely. Man Overboard – Observe MOB or instruct crew to do so – Demonstrate correct direction and speed of approach – Make suitable contact with MOB. High Speed Manoeuvres (if appropriate) – Use kill-cord if appropriate – Choose suitable area – Show awareness of other water users – Warn crew before each manoeuvre – Look around before S and U turns – Control speed on U turns. Handling Under Sail (if appropriate) – Sail triangular course with one leg to windward – Choose suitable area for hoisting/lowering sails – Use sails suitable for prevailing conditions – Show awareness of wind direction – Trim sails correctly on each point of sailing – Warn crew before manoeuvres – Look round before tacking and gybing – Control sails during tacking and gybing. Coming Alongside Windward Pontoon – Communicate effectively with crew – Show awareness of other water users – Prepare warps/fenders – Choose correct angle of approach – Control speed of approach – Stop boat in place required and secure to pontoon – Stop engine. The United Nations Economic Commission for Europe Inland Water Committee Resolution 40 (hereafter called Resolution 40) International Certificate for Operators of Pleasure Craft (known in the UK as the International Certificate of Competence (ICC)) is documentary assurance from one government to another that the holder meets the levels of competence laid down in Resolution 40. It is NOT a qualification. The resolution states that the ICC may be issued by a government to its nationals and residents who are bound for the waters of foreign countries on vessels registered by that government, on condition that it accepts the requirements and conditions set out in Resolution 40. This means that a UK ICC allows UK Citizens and bonafide UK residents in UK registered pleasure craft (up to 24m in length) to visit the waters of foreign states that participate in Resolution 40, without the need to comply with those states’ Cabotage laws, particularly their national certification requirements which in many cases are compulsory. The UK is one of only a few countries which have fully accepted Resolution 40. Many countries have not adopted Resolution 40, some still apply Resolution 14 which Resolution 40 was intended to replace. Others only apply Resolution 40 in part or with caveats attached. In reality, however, the ICC is more widely accepted as proof of the holder’s competence. Spain, Greece and Portugal for example, have not adopted Resolution 40 but are still likely to ask visitors for an ICC. Some states may accept UK (RYA) ICC as an alternative to their national qualification on their nationally flagged vessels, but this should NEVER be assumed. The onus is on ICC holders to determine its acceptability by foreign states. The ICC was never intended to be an alternative to individual national qualification requirements. 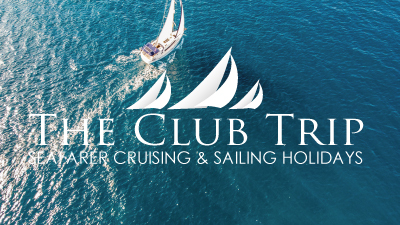 The advice to anyone planning to charter abroad is to obtain from the charter company (preferably in writing) details of the certification they require, what cruising area this is acceptable for and that this certification will also meet the requirements of the relevant authorities in the area concerned. The RYA is working towards wider acceptance of Resolution 40 and conformity in its application. Once Resolution 40 is universally adopted, the ICC may then become more like an international driving licence in application for visitors. 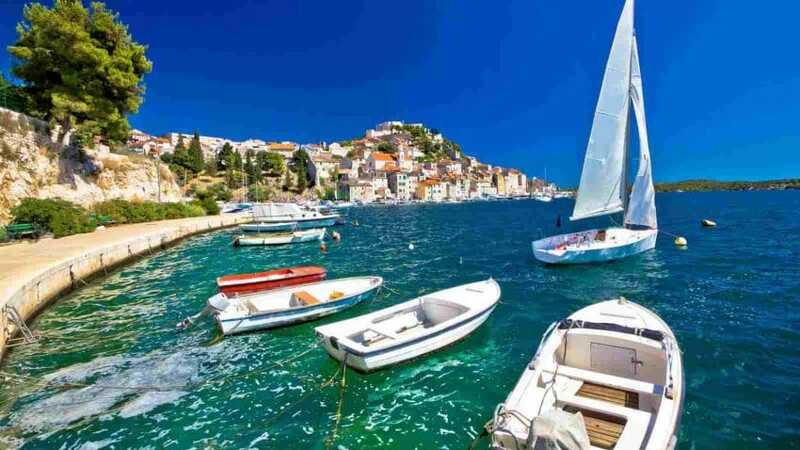 Location: Sivota Harbour, Lefkas Save up to £300 per person: If you're excited and ready to book, call us on 0208 324 3118. If you’re excited and ready to book, call us on 0208 324 3118. A 50% supplement applies for single cabin occupancy on the training boat. An en-suite cabin is available on our Bavaria 39 tuition yachts, at a £50 supplement per person per week. A £50 discount applies to saloon berth bookings on our Bavaria 39 tuition yacht. A 10% multiple course discount applies when 2 or more courses are booked for an individual at the same time. For prices of mile-builder, experience yachting and all shore-based theory courses please call for details. Guide price for flights to Preveza and transfers to / from Lefkas, from £295pp For flights to Preveza please call for details. Extras: Instructor’s food, accommodation (if not on student’s yacht) and return travel if he/she not dropped at base, payable at location at cost. 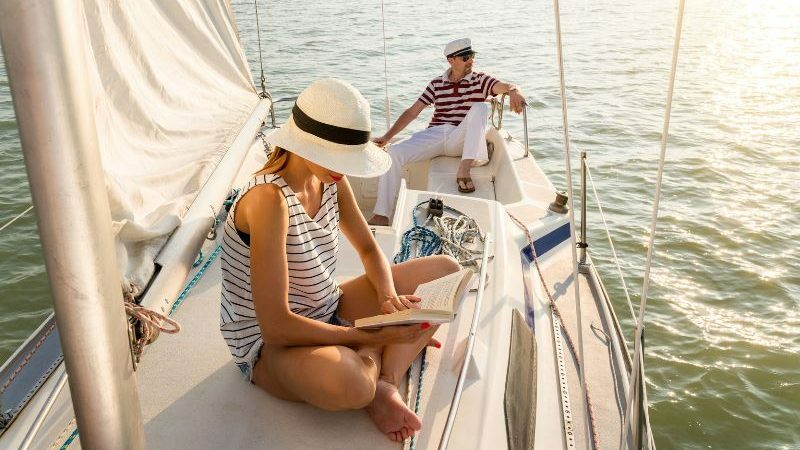 Private tuition charges apply to when clients charter a suitably equiped tuition yacht exclusively for their party and we provide an instructor on board for the duration of the course.